Recently, I was asked to participate in the American Lamb Board’s Dinner for Two Recipe & Photo Contest, which is a absolute treat because I really do love lamb. Even more awesome, is that they sent me some lamb to use in developing a recipe for this contest. Seriously like Christmas. Delicious, lamb-filled Christmas. Or, Valentine’s Day, actually, since the theme of this contest is Dinner for Two. There are a lot of components here, but it’s all pretty manageable even for a week night. After getting home from work, just start with getting the tomatoes ready to go in the oven and you can roast those whenever. Rub the lamb with the smoked paprika. Start the risotto. 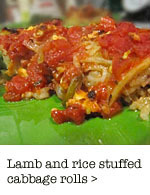 The lamb can rest for up to 15 minutes if you need more time to finish the tomatoes or risotto. For extra time-saving, you can even prep the olives, shallot and garlic the night before (just store in the refrigerator until ready to use). And, if you don’t want three burners going on your stove top, take a short cut and heat the broth in a glass measuring cup in the microwave, then just pour it into the risotto by the 1/2 cup measurements. It’s not the traditional method, but it will work. 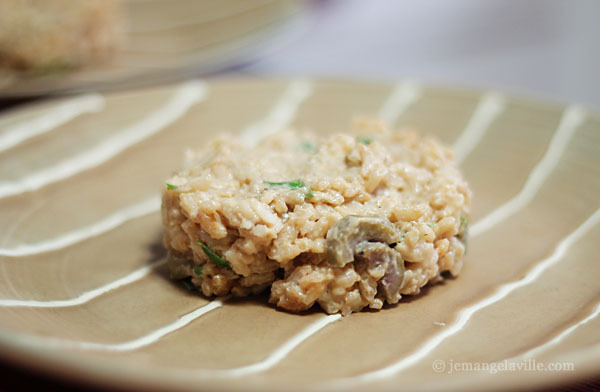 It may just take a few minutes longer for the risotto to cook. 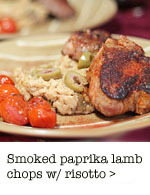 Preheat the oven to 425 degrees F. Rub the smoked paprika on lamb chops. 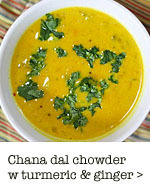 Sprinkle both sides with salt and pepper and let sit at room temperature for 15-30 minutes before cooking. To start the risotto: add the stock to a small pot and bring to a simmer. In a heavy-bottomed pot, heat 1 tbsp olive oil and add the shallot and garlic over medium heat. Cook until soft and just starting to color. Add the rice and dill and stir to coat in oil. Cook for about a minute. Add the wine and stir until absorbed. Start adding the broth by 1/2 cupfuls and stir occasionally. 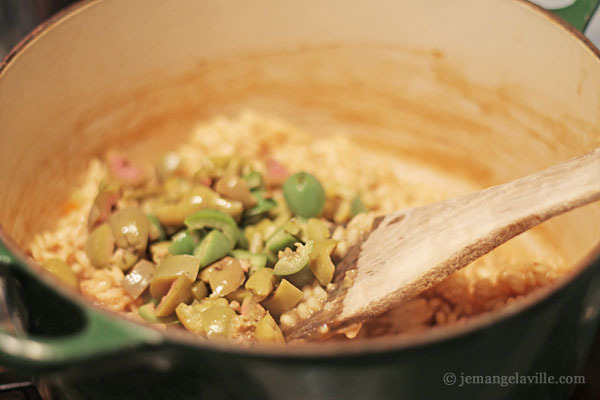 Adjust heat as needed to keep risotto at a strong simmer/weak boil. With the last addition of broth, add the goat cheese, olives and parmesan. Stir and taste, add salt and pepper as needed. Plan on about 25-35 minutes for the risotto to cook. 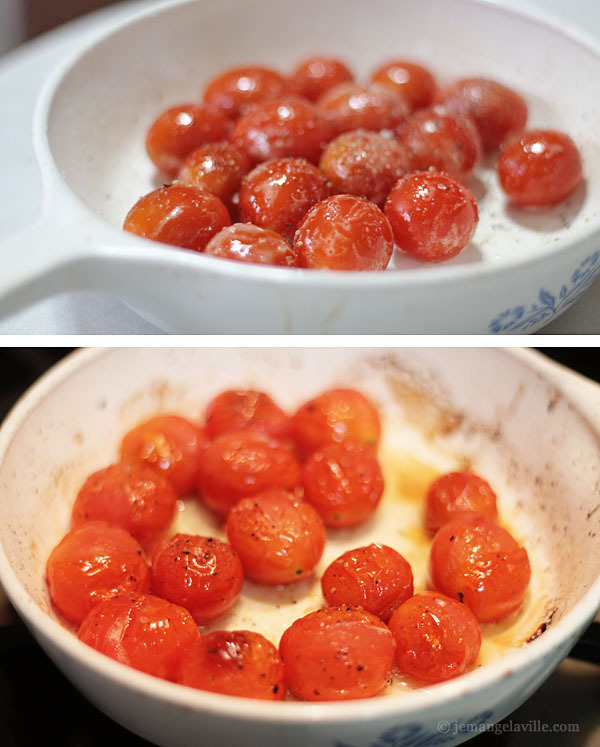 To start the tomatoes: Wash and dry cherry tomatoes. 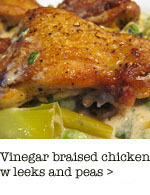 Add to a small oven-proof pan and drizzle with a little olive oil, salt and pepper. About 15 minutes before serving, roast in the oven for 15 minutes, until they just start to split and get golden in places. To cook the lamb: After you start the risotto and the lamb has sat for a bit with the smoked paprika, heat a skillet over medium-high heat. 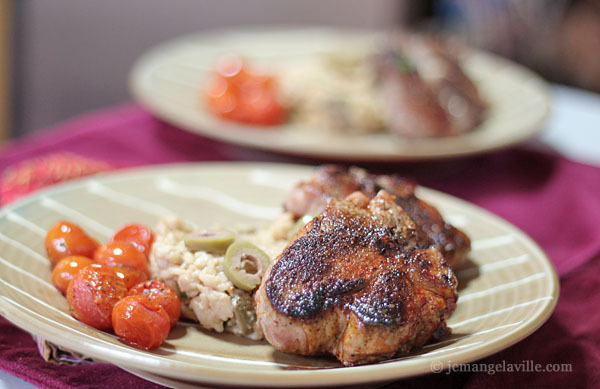 When hot, drizzle some olive oil over the chops and cook the lamb 4-5 minutes per side. 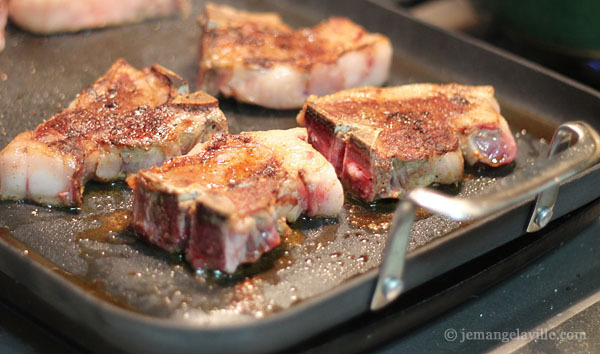 The temperature when you pull the chops off the heat should be about 130 degrees F for medium-rare. 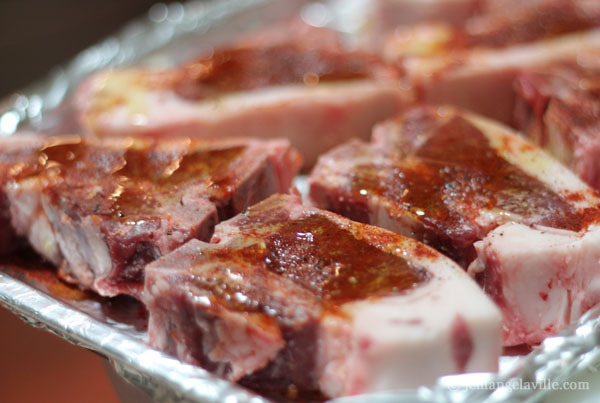 Let rest covered with foil for 5-10 minutes. 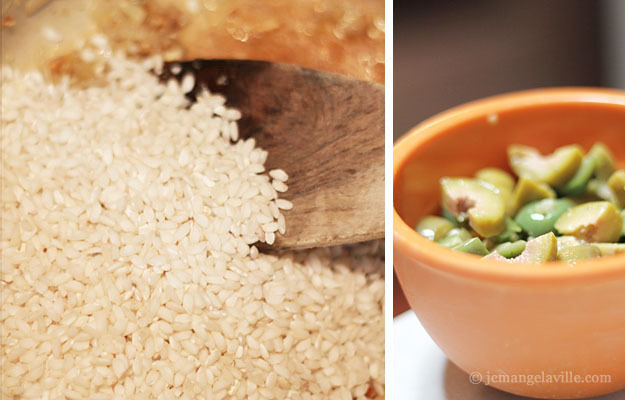 To serve: If you have a ring mold, use it to place the risotto on the plates. If not, scoop some risotto into the center of each plate. 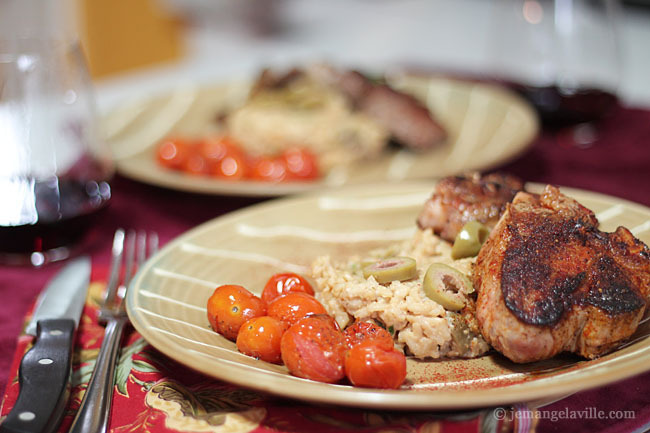 Rest 2-3 lamb chops against each risotto mound and add the roasted tomatoes to the side. 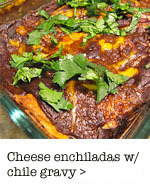 Sprinkle a little extra smoked paprika across the plate and serve. You ate the best chef in the world! I wish we lived closer! Oooops! I meant ARE! Obviously, I am thinking about food!